The NCDA partners with WOW Leap Inc. and other stakeholders in undertaking activities to make Tacloban City’s Local Disaster Risk Reduction and Management plan gender and disability inclusive. The NCDA, City Government of Tacloban (CGT), WOW LEAP and Inclusive Development and Empowerment Agenda (IDEA) vow to undertake activities for capacity building and technical assistance to gender and disability inclusion in DRR, including awareness and advocacy efforts. In undertaking their joint project called “Building Back Better: Making Rehabilitation and Recovery Inclusive”, all parties will collaborate together to understand the barriers and enablers to inclusion of women with disability in recovery and rehabilitation of Tacloban City. They will work to empower women with disability in Tacloban City to meaningful participation in making the city resilient to disaster and will sensitize key stakeholders in Tacloban City on gender and disability to create an enabling environment for inclusion and meaningful participation. As an initial step, a Multi-Stakeholders’ Consultation was held last July 13, 2015 in Hotel Alejandro in Tacloban City. The well-attended affair was participated in by officials and representatives from the CGT, WOW LEAP Inc., IDEA, NCDA, City Social Welfare and Development Office, international NGOs, organization of women with disabilities and Persons with Disability Affairs Office (PDAO) in Tacloban City. 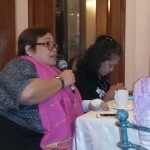 NCDA Acting Executive Director Carmen R. Zubiaga briefed the participants on Proclamation No. 688 “Declaring the Period of 2013-2022 as the Philippine Decade of Make the Rights Real for Persons with Disabilities in support of the 3rd Asian and Pacific Decade of Persons with Disabilities” and the 10 goals of the Incheon Strategy to implement the UN Convention on the Rights of Persons with Disabilities, specifically Goal 7 which mandates the government to ensure disability-inclusive DRRM. Persons with disabilities including women with disabilities should be represented in Disability Preparedness Council, she stressed. 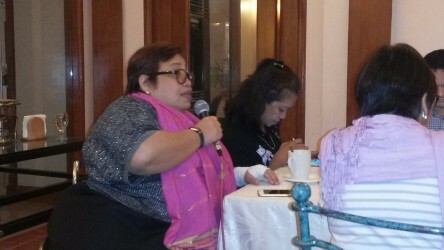 WOW LEAP President/Program Manager and NAPC PWD Sectoral Representative, Ms. Joy Garcia, in her message, called for a unified and comprehensive efforts to make DRRM plan disability and gender inclusive. She said that women with disabilities who are considered triple marginalized, should be empowered and should contribute in the DRRM development plan. IDEA President, Mr. Jerome Zayas, on the other hand, fully discussed the project and enjoined everybody to share reports on their contingency plan and/or best practices on DRRM for documentation. On behalf of the TCG, Assistant City Administrator and OIC of the City DRRMO, Mr. Brando C. Bernadas expressed the full support of Mayor Alberto S. Romualdez to persons with disabilities, pregnant women, senior citizens and other vulnerable groups. He said that the Mayor’s Office is now key positioning the Yolanda evacuees and has a color-coded “Evacuee ID System”. The ID system works hand-in-hand with color-coded evacuation centers where the families only need to find the evacuation center with the same color as their ID in the evacuation map of their barangay. In related development, the NCDA and WOW LEAP officials, together with Ms. Flerida V. Labanon and Ms. Florita J. Bisco of NCDA and Dr. Maureen Ava Mata of WOW LEAP, also witnessed the oath-taking of the newly elected officials of the WOW LEAP Tacloban City which was officiated by Councilor Cristina Romualdez. Councilor Romualdez thanked the group for their support to the Taclobnanons and labelled women with disabilities as “abled women.” The Councilor spearheads the CLEP (Cristina Learn and Earn Program), a comprehensive livelihood entrepreneurial program for marginalized Tacloban women including those with disabilities, equipping them with special skills that would augment income of the family if properly used.